Retrieve and use in My DSO Manager key Creditsafe information about your customers to optimize your risk management. 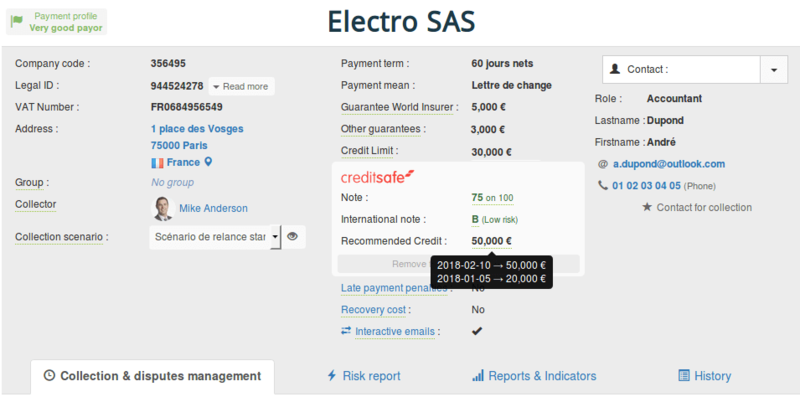 Latest news of My DSO Manager, innovative credit management software for all sizes of companies (our solution is used by SME as well as big international groups), allowing to include your Creditsafe data (« Note » and « Recommended Credit ») to your customers files using our new connector « Creditsafe Connect ». This new feature allows you to daily follow-up your account receivable against Creditsafe's recommendations, updated daily in My DSO Manager, and thus facilitates your credit risk management. → The change history is visible by flying over the elements. logo opens the detailled report of the company on the Creditsafe web page. What is the result of 3 8 ?